Freshly named Mobile Marketer’s ‘2010 Mobile Marketer Of The Year‘ – Starbucks continues to make the right moves, on the right platforms, with the right people – their customers. I’ve written about Starbucks multiple times on this site in the last couple of years, giving them loads of credit for the way that they effectively market their brand while keeping in mind that their main role is how to best service their customers. 5 words – 4 important to the customer, 1 very important to Starbucks (measurability). They are clearly customer centric, with the aim to 1) Make it easy on their customer to do business with them 2) Make the experience relevant and, most importantly 3) Build an intense level of loyalty with their patrons. What better way to accomplish those things listed above than to create a set of tools that are with you all the time, on the computing device you use most often? Your phone. This device provides an opportunity for Starbucks to interact with their patrons multiple times a day, providing them an enhanced experience with a product they clearly love, and (this is important to a marketer) get real time data about those people and how they interact with your brand in a non-intrusive and invisible fashion. People are willingly interacting with Starbucks because they are getting perceived value from their experience on their mobile device. Well done, Starbucks – you’ve set the bar. The iPad: Changing How We Build Business Relationships – Inc. In short, this campaign is a crowdsourcing effort – not unlike Dell’s IdeaStorm, Best Buy’s IdeaX, and My Starbucks Idea – that channels funds that would have been applied to SuperBowl advertising, into a user identified community giving program. The difference? Execution. Pepsi’s effort was fraught with privacy and security issues that tarnished the first step of what could be a very good campaign. There is upside however. I think that many people will respect what Pepsi is attempting to do. Rather than spending millions of dollars on less than a minute’s worth of shameless self promotion during the world’s largest sporting event – they are putting those powerful dollars towards programs that will have a positive impact within the community – a generous foray into Cause Marketing. Kudos to them for that. 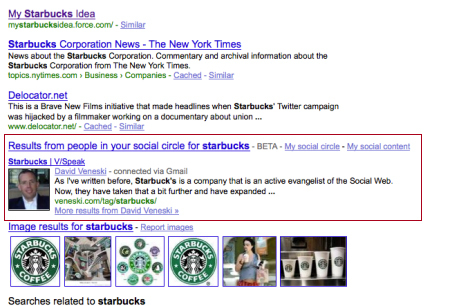 As I’ve written before, Starbuck’s is a company that is an active evangelist of the Social Web. Now, they have taken that a bit further and have expanded that to the Mobile Web with the release of two new iPhone apps: myStarbucks and Starbucks Card Mobile. Targeted at coffee drinkers on the go that are hyper-connected with their iPhone or iPod Touch, these apps offer the convenience of loading a Starbucks card through your mobile device and “a groundbreaking mobile payment component that will allow customers in 16 stores to pay using their iPhone or iPod touch mobile device“. The myStarbucks app “will allow users to build and share their favorite beverages, find store locations anywhere in the world, look up detailed nutritional information for Starbucks food and beverage items, build and store favorite Starbucks® espresso drinks, and learn more about Starbucks rich selection of whole bean coffees.” (via Starbucks Newsroom). Well done Starbucks – identify an opportunity to add convenience to your customer experience and deliver innovation on the mobile front. Starbucks – rebranding, and serving alcohol? CNN Money reports today that in at least one Seattle location, Starbucks is undergoing an identity change and swapping out it’s globally recognized brand name in favor of a more local ‘flavor’ – naming each store to reflect it’s neighborhood location. In addition to this name change, Starbucks is planning on also transforming the experience the customer has within the store itself. Beyond their trademark coffee and tea offerings they are planning on adding beer and wine to the beverage list and ‘opening stores with a more sophisticated tone that hearkens back to its early coffeehouse days‘. It’s an interesting move. Starbucks has faced declining sales in the last year as the economy has pulled back and the customer is closely watching their pocketbook in the face of financial uncertainties. Premium coffee habits have given way to more pressing needs in the minds of consumers. Will changing a globally recognized brand name and revamping the customer experience inside the store help this? From my perspective, they should have tapped into their thriving community to see what they thought of the idea. They clearly have a valued and active area for people to share their thoughts and wishes – why not ask for something back from that same community when Starbucks is testing a new concept? That would have been the smart move. This will be an interesting one to watch. Now instead of grabbing a ‘Starbucks’, I guess at least some coffee addicts in Seattle will be grabbing a 15th Ave Coffee. Just doesn’t have the same ring to it. Then again, you can’t get a beer at a Starbucks so they’ve got that going for them! Our commitment at Intel is to build cross platform social campaigns – using all mediums available to us, including print, broadcast, and out of home vehicles. We’ve started already with the launch of our new campaign ‘Sponsors of Tomorrow‘ by bridging our out of home placements with our web presence (we took over the Times Square Nasdaq and Reuters boards with the a request to text in your view of ‘Tomorrow’ that is then displayed on our website). In addition, we have a very active social stream through Twitter, YouTube, and our Consumer Blog. 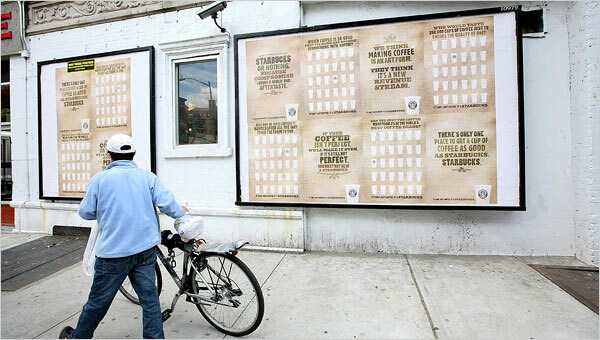 Starbucks has done something similar in their new campaign – leveraging offline media to bolster online communities. It’s well known that Starbucks does not embrace traditional advertising. For this effort, they’ve strayed from that tenant by placing large format posters in 6 major cities across the U.S – taking their campaign off line and to the streets. However, true to their commitment to social media and their community (see yesterday’s post), they’ve also integrated social sites and tools like Twitter (183k followers), Facebook (1.5M fans), YouTube, and Flickr - counting on their active community to extend the campaign message through earned media. Well done Starbucks – you’ve recognized the correlation between paid and earned media. I’ll watch your new campaign with interest….